Inspired by street food and cultures around the world, PasarBella presents a dynamic food and beverage collective, nestled in the heart of the City. The energy here is equally inspired. 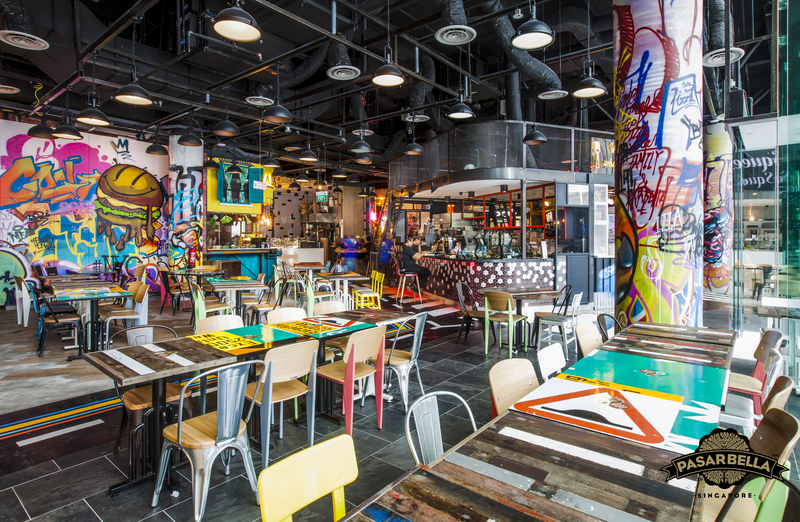 Walking through the doors, your eyes are treated to a blend of organic and industrial elements, peppered with neon and graffiti. Refuel here and you will find a much-needed respite from the glass and concrete monotony of the city. PasarBella is the embodiment of its namesake, which is derived from the local term for ‘Market’, and the Italian term ‘beautiful’. This uniquely dynamic dining experience is a culmination of street food and food truck favourites from the region and rest of the world, where both food and style are equally inspired, modern, yet familiar. By curating and showcasing the best of the classics, modern and culinary crossovers, PasarBella hopes to offer a blend of accessibility, fun and value. With over 200 dishes hailing from Asia, the US and even the Middle East across a band of 10 unique vendors, diners are truly spoilt for choice. PasarBella aims to have our guests leaving with bellies full with treats, and hearts filled with good vibes. So the next time you’re in the city, make us your pit stop and treat yourself to a healthy workday lunch, sinful feast with family and friends, or even a post-meal tipple. Food for the people. By the people. PasarBella serves as a platform for creative expression, where vendors from different walks of life come together to present culinary ideas are innovative yet remains true to their heritage. Ultimately, this provides customers with better dishes on plates that are presented in ways that are more relevant to current tastes. When the weather permits, head outside and enjoy an alternative dining experience. Take your shoes off and watch white collars bustling by while you sip wine and indulge in your favourite meal. Also, the fresh air and picturesque view of one of the world’s largest water fountains is on the house! Be sure to come with an empty stomach and a happy heart!